Is Kerala CM Pinarayi Vijayan imitating Narendra Modi? To a dyed-in-the-wool Communist, any suggestion that Kerala’s Marxist Chief Minister Pinarayi Vijayan is emulating Indian Prime Minister Narendra Modi would be nothing short of blasphemy. For them, who draw their political sustenance tonic from their vehement anti-BJP stance, drawing such parallels between the two is political hara-kiri. However, instances of Pinarayi imitating Modi are legion, starting right from the pre-election days. Just like our Prime Minister did, Vijayan too hired an image-management team before the elections. Moreover, the Chief Minister managed to outwit his senior colleague and nonagenarian VS Achuthanandan in the struggle for leadership with some adroit political manoeuvring. Even as he spoke highly of the former Chief Minister, Vijayan stealthily outflanked him with some covert moves. It was reminiscent of NaMo’s skillful handling of the senior BJP leader and elderly statesman LK Advani and successfully sidestepping him for the top job. After becoming the PM, NaMo had famously announced a series of development programs with apt and appealing names such as Swachh Bharat Abhiyan, Beti–Bachao Beti–Padhao Scheme, Namami Gange program, Make in India campaign and Skill India mission. Apparently, taking a leaf out of Modi’s book, Pinarayi has launched four major pro-poor initiatives and have given them catchy names. For instance, he has called a waste management and organic farming project as ‘Harita Keralam’ (Green Kerala). Another project to make government hospitals people-friendly is termed as ‘Ardram Health Mission’. Similarly, an ambitious scheme to offer houses to the homeless is named ‘Home for All’, while an education modernization and empowerment program has been titled ‘Pothu Vidhyabhyasa Samrakshana Yajnam’. Similarly, when the Pinarayi government completed 100 days in office, the Chief Minister addressed the people of the state through a radio broadcast. There, we got to see a copycat effort of the regular ‘Man Ki Baat’ by our Prime Minister. However, Vijayan denied any such connection when asked by journalists. “I was not emulating Modi. I delivered the speech on being requested by Akashvani,” Vijayan had said. These were not the only imitations of Modi by the comrade. Just like the Prime Minister, the Communist leader avoids talking to the media on most occasions. In fact, he has even asserted that it was not his job to brief the media after every Cabinet meeting. “The Chief Minister need not take up the role of a Public Relations Officer. It is a bad practice to brief the press after each cabinet meeting. It is the work of the Public Relations Department,” he elaborated. Like Modi, the Chief Minister too likes to have a tight control over the party and the government. He also ensures the final say in important matters. Both have excellent work ethics and both show decisiveness in taking decisions. The similarities don’t end there. There are too many to be missed. Both Modi and Pinarayi are very conscious of their own images and astutely try to protect them. 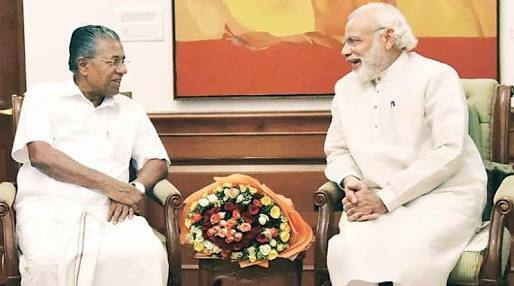 After being designated as Chief Minister, Vijayan has been consistently striving to enhance his image by staying away from all kinds of controversies. As part of this, he has also made a few symbolic gestures, which has enabled him to project an image of being a man of consensus and reconciliation. Furthermore, his own party comrades privately say that the Chief Minister swiftly sacked the Sports and Industries Minister EP Jayarajan mainly to safeguard the no-nonsense image he has meticulously created among the masses. Though Jayarajan is very close to the Chief Minister, Pinarayi had to let him go on charges of nepotism, particularly since the government and the party’s image had suffered a setback on account of Jayarajan’s misdemeanours. Beyond all these, just like the Central leader, Pinarayi does not let ideological matters interfere with his state’s developmental agenda. A case in point is Pinarayi’s close co-operation with the Centre and the excellent rapport he is striving to have with the Prime Minister. In the past, whenever opposing parties ruled at the Centre and the state capital, allegations of “negligence” and “step-motherly treatment” flew thick and fast. Instead, Pinarayi has publically complimented the NaMo-led NDA government for its “creative response” and support for Kerala’s development. Admitting that “we definitely have political differences,” the Chief Minister said the truth is that such differences had never come in the way whenever “we have raised the general issues concerning the state.” The responses by the Prime Minister and other Central ministers to the development needs of Kerala have been very positive so far, he added. Whether Vijayan is aping NaMo or if the similarities in the Chief Minister’s actions are accidental is debatable. Asserting that Vijayan is indeed trying to imitate the Prime Minister in a bid to become more popular, BJP Kerala chief Kummanam Rajasekharan said the problem is Vijayan is not an honest politician like Modi. Meanwhile, Congress leader Ramesh Chennithala too thinks Vijayan is trying to copy the Prime Minister. He said this while referring to Pinarayi’s decision not to brief the media every week. However, CPI (M) State Secretary Kodiyeri Balakrishnan stoutly refuted any move by the Chief Minister to ape Modi and stressed that such discussions are unwarranted. But no one seems to be complaining as the actions by the Kerala Chief Minister have been positive so far. This entry was posted in blog on December 5, 2016 by admin. If all CMs will emulate just the integrity and sincerity aspect of our PM, I think our nation will be the least corrupt nation. Atleast the power houses will not be corrupt. A good read. But which politician is broad-minded enough to say that he is emulating the one with whom he has ideological differences per se? Prime Minister lacks the capability to connect with opposition leaders. Agreed, demonetisation may be good for India, but he should be able to sell this to opposition leaders. Pinarayi has no choice. He has to toe Modi’s line for budgets and allocations. Kerala is money starved and there is no other way than to impress the boss for favours. Typical corporate culture. At least in south India we have found one politician who can think of integrating with the central government on policy matters. This is a good wave here in political as well as social aspects. People of Kerala are almost above every other state of country in terms of income, literacy and other developmental norms. They understand politics and hence Vijayan has to fulfill their dreams. Kerala is a state where murders of conflicting political workers is a common notion. If in such a case, BJP and Left workers can work in tandem, it will benefit the state. Modi government has worked with business houses to increase exploitation of workers. How can they be similar to Vijayan government? Modi is pro-rich and anti-poor. Both leaders have one bit in common. They will not connect with cheap rhetoric of party leaders and workers and this is what that makes both of them a mass leader. It was wrong to judge BJP as a party of Right. In my view, they are not inclined and are centre. Similarly Left party in Kerala is now moving towards centre. It is hard today to differentiate between communist and non-communist. Today politicians need industry and labours equally and they promote them on equal grounds. Kerala chief minister Shri Pinarayi Vijayan is a veteran. He cannot be compared with anyone from north India which is an absolutely different political space. He knows what is best for Keralites. It may be too early to say that CM Vijayan is copying the programmes and policies of Narendra Modi. Both are visionary leaders and they pick what benefits people.